If you follow Sony Addict on Twitter you know I was recently in NYC testing the Techart Pro adapter at B&H Photo with our contact Abe. I have been shooting pretty much exclusively with this adapter on my Sony A7M2 since receiving it, and firmware 3 fixed the vast majority of crashes I experienced during my first stress test shooting a show. 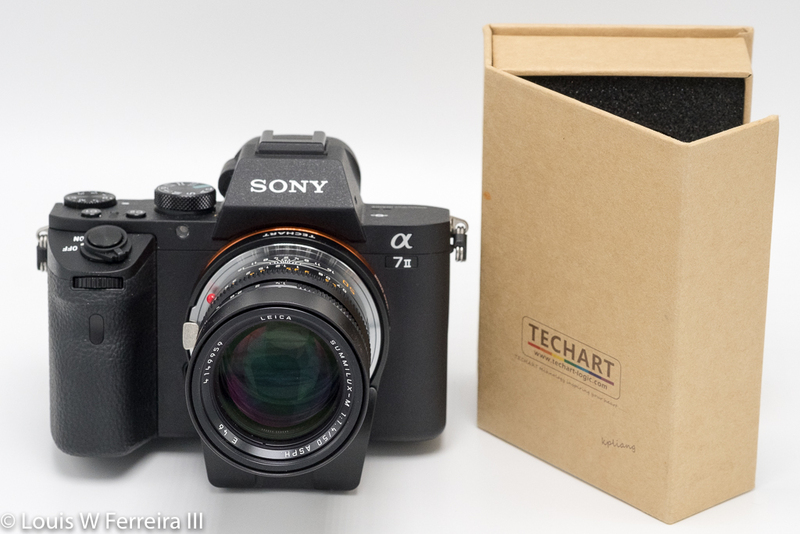 If you’re a fan of Leica glass and own a Sony body the TechArt Pro is a must have accessory. I can only say this with confidence because I personally tested 73 lenses on the Techart Pro and only TWO failed to work correctly! That’s right, TWO, the Leica 90mm Macro-Elmar-M f/4 (but I would like to try a second copy because of it’s unique design) and Voigtlander f4.0 Color-Skopar 25mm f/4 P (the lens was too wide at the base and pressed against the adapter). There are other things I learned about the Techart Pro by testing such a large variety of lenses. For reference when you first mount a lens on the adapters it should be focused on infinity for the adapter to work optimally. Lenses wider than 35mm almost universally macro focus, while 35mm lenses have negligible macro capabilities when set at infinity. “Normal” focal length lenses, around 50mm, focus as per specification. Beyond 50mm the majority of lenses need to be moved off infinity to close focus, and they generally do not have macro capabilities. Even the Noctilux will focus, but it is right at Techart’s 700g recommended weight limit, so I would be careful with this lens attached if you are going to use it for extended periods of time. The physical gear inside that moves the lens closer and further from the sensor moves all of the lenses at about the same speed, so I do not feel it is important to reference focusing speed beyond saying that this adapter will let you track with an M lens, but focusing from infinity to a meter away isn’t fast. The Techart adapter is best at making quick adjustments between a few feet and inches, which will satisfy most users. It is also far from silent so the adapter isn’t usable for video. When I was testing the adapter in the store, employees and customers were impressed by how well it worked and I didn’t even demo how easy it is to update. No one is doing firmware updates as conveniently as Techart at this time. I love their implementation of Bluetooth, where I set my camera to F90, press the shutter button, turn the camera off, and let the app do the rest. No pairing required, and all from my phone. You can even downgrade your firmware from the app if you have an issue or a preference. It’s hard to find anything wrong with this adapter, and I tried my best to find things that wouldn’t work. My only issue is a nitpicky one, but I would like a way to write metadata to the raw files with the correct lens names via the app. Techart just made the app so easy to connect to the camera that I think they should exploit the feature further by adding a text field or drop down menu so that we can name the lens that is attached. I know this could make things more difficult if someone switched lenses and forgot to change the name, so they could also implement a feature that reset the name when the camera is powered off completely. A feature like this would be a time saver for many that like highly organized Lightroom catalogs. Below you will find a list of all of the lenses I tested in black (I also tested silver/chrome because they are heavier and many are made of brass, but I didn’t include links to them order to condense the list below). If they worked normally, there is no marking by the name; but if they have macro capabilities there’s an *, and if they need to be moved off infinity to focus close I marked them with **. I also put a legend below the list. Once again, I must thank Abe and B&H Photo for their hospitality and assistance. Without them I never could have gained access to this many lenses, and there might be a few more on the way soon. I’m going to do my best to keep this list up to date and I am accepting glass to test if anyone has anything obscure to test. This entry was posted in 3rd Party Lens, Accessories, Sony a6000, Sony a6300, Sony a68, Sony a7 II, Sony a7R II, Sony a7S II and tagged Techart, TECHART LM-EA7, TECHART PRO. Bookmark the permalink. Trackbacks are closed, but you can post a comment.